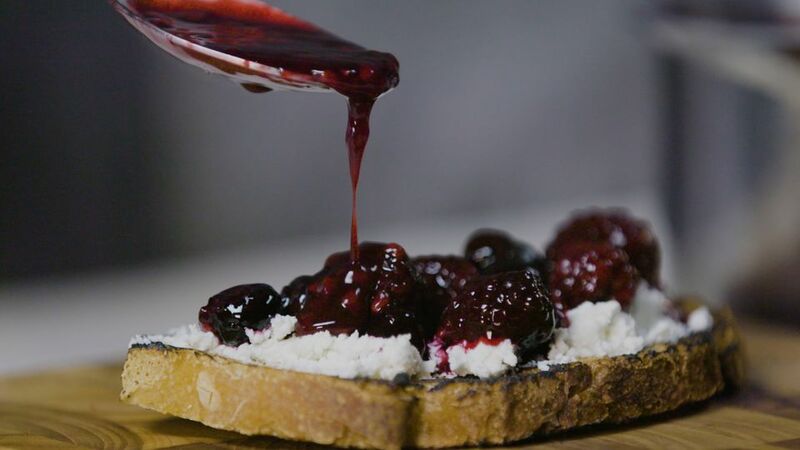 Reminiscent of a creamy berry cheesecake, this toast is a wonderfully sweet, tarty, and creamy way to start the day. Adding fresh mint is an unexpected but very worthwhile finish touch! In a saucepan combine the blackberries, blueberries, cornstarch, vanilla, sugar, and water. Cover and cook over a medium-low heat. Once simmering, mash and mix well. Set aside. Slather each slice with goat cheese and top with a spoonful of the warm berry mixture. Sprinkle with some chopped fresh mint if you have it.